Cambridge Analytica Whistleblower: Bannon Absolutely Wanted The Data For "Alt-Right Candidates" [VIDEO] - Joe.My.God. 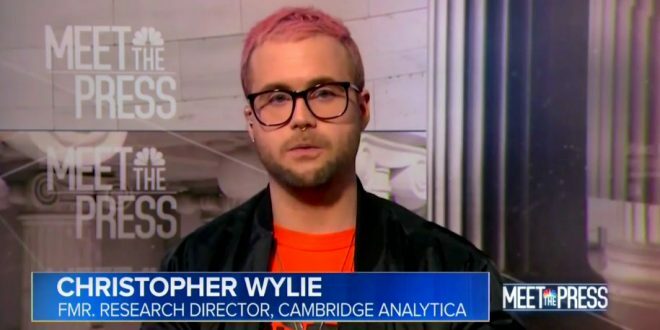 Christopher Wylie, the former Cambridge Analytica employee who sounded the alarm on the firm illicitly obtaining user data from Facebook, told Meet the Press’ Chuck Todd that Steve Bannon “absolutely wanted to use [the data] for Republican candidates … [and] alt-right candidates in the United States.” Wylie also said he’s been contacted by American authorities — both from Congress and the Department of Justice — and that he plans to cooperate with them as they investigate Russia’s role in the 2016 election. Some of the information improperly harvested from Facebook Inc. users might be stored in Russia, said Wylie. The data “could be stored in various parts of the world, including Russia.” “The professor who was managing the data harvesting process was going back and forth between the UK and Russia,” Wylie said, an apparent reference to Cambridge University lecturer Aleksandr Kogan.